New Delhi, 2017. It is nine years since the 26/11 terror attacks in Mumbai and the wounds have still not healed. Especially not for Superintendent of Police Vikrant Singh, who ends up landing a slap on the High Commissioner of Pakistan's face when he meets him at an event. Meanwhile, in Bhopal, five members of the Indian Mujahideen, arrested by Vikrant, break out of the Central Jail. Vikrant, suspended for the diplomatic disaster, is unofficially asked to assist the team in tracking the escaped terrorists. In another part of the country, a retired tycoon, a heartbroken ex-soldier and a young woman dealing with demons of her own embark on a journey of self-discovery aboard a cruise liner from Mumbai to Lakshadweep. Fate, however, has other plans, and the cruise liner is hijacked. Racy and riveting, this is Hussain Zaidi at his best. I’m a sucker for crime thrillers and if it has to do with investigators and detectives then I’m all game. Coincidentally, I’m typing this at the eleventh hour as I’m a little behind schedule in posting the review, but I’m glad I picked this book up for review. 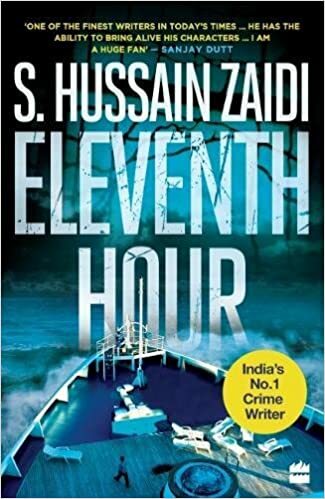 Eleventh Hour by S. Hussain Zaidi has all the makings of a high-octane, fast-paced thriller that talks about the cat-and- mouse chase of the country's Intelligence Bureau (IB) and the terrorist group. It starts with a reference point of the 26/11 attacks in Mumbai that transpired in the year 2008 and what is going to transpire nine years later in 2017. The story begins with a bang, quite literally when an irate SP Vikrant Singh punches a Pakistani diplomat for not delivering justice to the victims of the 2008 terror attack. It revolves around the efforts of this passionate and patriotic officer and his senior Mirza - the mentor-protege duo - and how go about catching the culprits and bringing them to book whilst preventing a major bloodbath. The beauty of it all is that it all boils down to the eleventh hour. The author does a great job in storytelling and it is easy to paint the scenes in your head while reading. Also gives us a glimpse of how the minds of the IB and police work in the country. The camaraderie between Mirza and Vikrant is well-written. One aspect can also work well for an anti-smoking campaign (ha ha!). Besides the fact that it has an engrossing storyline, it also has all the makings of a thrilling Bollywood script. Gripped me from the very first page. It’s a rare trait for books now-a-days. Secondly, the surprise element right at the end of the climax caught me by surprise. Thirdly, a Mumbaikar can easily relate to the locations mentioned in the book. I found it easy to identify one of the culprits. A must-read for thriller buffs like me. Cannot put it down. What attracted me towards this self-help book, you ask. The DAMN interesting blurb, of course! Right from the word go, the author has you hooked. His uncanny way of describing the inner workings of any company - be it a start-up or an MNC - is simply hilarious to the tee. He describes, sarcastically of course, the ‘better’ way of doing things - does not matter if you are a fresher or a part of middle-management. Rishi does justice in the description of the work atmosphere in various types of organisations, even Public Sector Units. In a rib-tickling manner, he highlights the inner workings and well-known but taken-for-granted details in the job way of life. Designed as a self-help book of sorts, he suggest you ‘stop wasting time’ and try and follow the ‘principles’ he suggests. They are bound to fit perfectly well with any and every type of Indian job scenario. Rishi cites ‘anecdotes’ or real-life examples as proof of the ‘principles’ he asks you to imbibe and follow in order to ‘Work Less. (And achieve) Career Success.’ Needless to say, these anecdotes are guaranteed to leave you in splits! When reading this book, you cannot help but sit back and reflect on how you must have acted in those typical situation in any job. 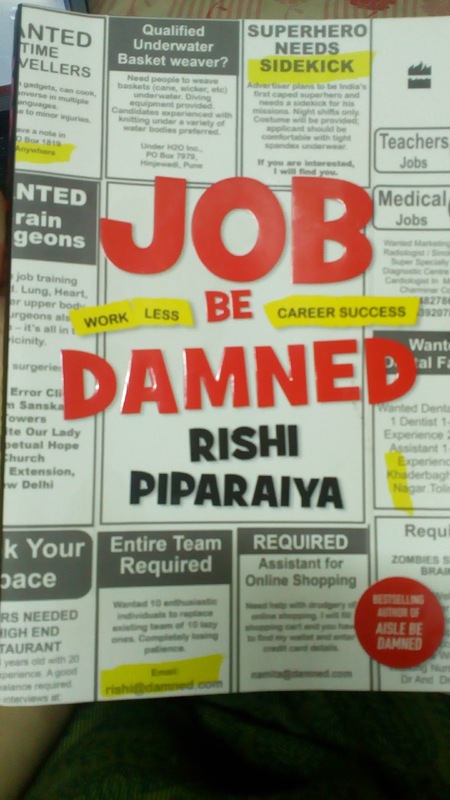 No matter which junction of your career you are in, you can relate to most things written in this book. The fact that I can’t read this when I’m in office. 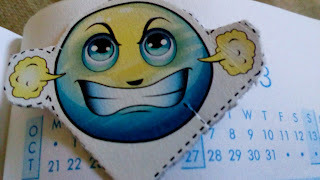 My boss won’t look too pleased if I keep sniggering like maniac! If you are a fresher or a highly experienced professional, do give this book a read. Fans of Dilbert’s comic strip are going to love this for sure. You might just learn a thing or two or can just simply reflect back on those DAMNED days! If this is a series, I'm looking forward for the next one! The deteriorating air quality in our country is there for all to see. Dealing with impure air is a battle that each one of us goes through day in and day out. Various cities including the national capital are suffering from the after-effects of increased air pollution and subsequent diseases of the lungs, nose, skin, etc. Breathing in contaminated air can make us more prone to various acute and chronic respiratory illnesses like bronchitis, asthma and various allergies. Air purifier as a concept may have been a novelty few years back, but in today’s times it has become an absolute necessity. The deteriorating air quality is leaving us breathless, however, the quality of air indoors is no different. Many schools were recently closed down in the capital due to the alarming air quality. Such steps become the need of the hour, because kids are most vulnerable to air pollution.They spend a lot of time indoors playing or studying. The air outside combines with the indoor air, hence making it difficult for kids and elderly people to breathe clean air. This makes a case for investing in a roomair purifier. When an appliance like an air purifier is installed in a room, it removes contaminants from the air, making it cleaner. Prior to purchasing one for your home, consider the room size, the type of filter in the device, the Clean Air Delivery Rate (CADR), and the air changes per hour. 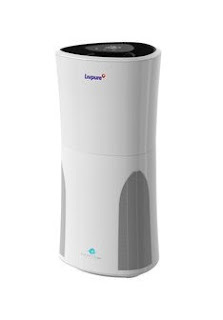 Air purifiers can be categorized on the basis of their coverage area. Some can cover an area of 450 sq. ft. while some can cover a 300 sq. ft. room. Depending on this factor, the air purifier price differs. Also, you can determine the different price brackets basis the CADR. Livpure is one such brand having a wide product range. You can browse through and make the right choice as per your needs and budget. You can buy one for your home and another for your car as well! 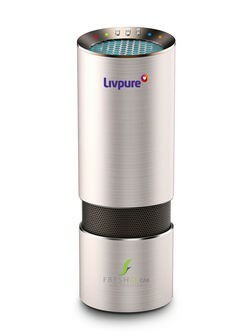 Check out www.livpure.in/air-purifier to get more information. Under the open sky, your kids are playing in the park with wild abandon, while you open the picnic basket with packed goodies for you and your family. 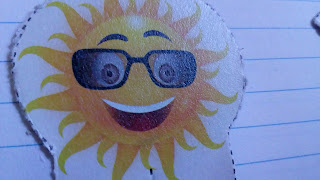 As the sun sets, there's a smile on your face as you sit on the grass sipping juice and watching your children be happy. Frankly, a mother like me would actually 'freak out' at the prospect of letting kids go free and wild in the open air surroundings. The probability of getting bit by mosquitoes is too high and is not one that is cherished. Not just kids, adults too are prone to mosquito bites that can increase the chances of diseases like malaria, dengue and chikungunya. And if you would have thought that wearing full-sleeved tops and bottoms is fine to avoid getting bitten, guess again! Not just in playgrounds and gardens, we need to protect ourselves and our family in indoor places too. As parents, most of our focus lies around our kids, with them being the centre of our universe. However, they cannot be figuratively tied to a leash, kept indoors all day and be disallowed from exploring their surroundings. In fact, the more the kids explore and figure out things by themselves, the faster they learn. Stagnant water is said to be a breeding ground for mosquitoes. These insects are known to lay their eggs in the water which breed rampantly and infest your home. You out to check the flower pots, the roofs, the verandah and your bathroom for sitting water that may act as breeding pools. This must be done time and again, especially in the rainy season. It is believed that plants and trees like Tulsi (holy basil), Neem and Lavender are helpful in killing mosquito larvae. Once the larvae are under control, it can help in curbing and controlling the population of mosquitoes. One of the ways is using a safe mosquito repellent. The idea of a repellent is to repel the mosquitoes by preventing them from landing or coming close. 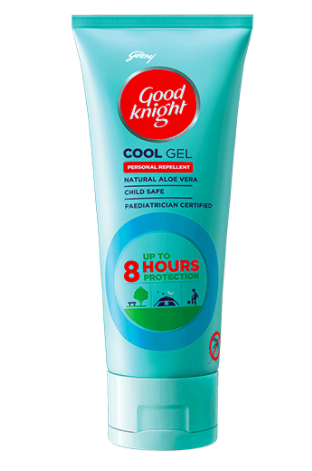 Although there are multiple brands in the market, the renowned brand, Good knight has designed repellents in the form of non-sticky gels, patches and fabric roll-ons that are 100% natural and provide up to 8 hours of protection from mosquitoes. 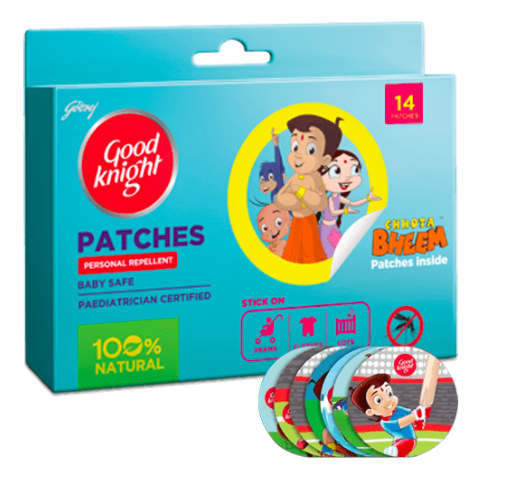 You can easily stick the patches onto your child's clothes or apply the aloe gel when they are playing on the playground. The mosquito repellent's aloe gel is a natural element that is not only cooling but also works like a charm. You can safely use this mosquito repellent for infants by sticking the patches on cribs. 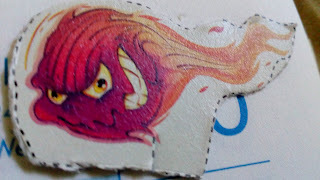 By using the ways that are in the best interest of you as well as your family, say goodbye to your fears of getting bitten! I am reading a book after what seems like ages, and I'm glad I picked up this one. It has opened up the floodgates for reading quite a few more. Thank you, Vivek and Flipkart for shortlisting me for reviewing this book. Will keep this review short and simple. The story revolves around Ketaki Roy, aka Kitty to her close friends and family. Working as a journalist for a fashion magazine, at times Kitty feels like she's a misfit. However, she is handed to cover the life of a high-profile yesteryear actress and socialite, Roxanne Merchant, which ultimately leads her into a web of the murky lives of big shots. 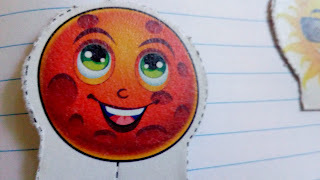 At the same time, an incident helps her realize her true interest: baking and spreading the sweetness with the world. How she unravels the real cause behind Roxy Merchant's death is what the crux of the story is. Firstly, this is one really great weekend read, filled with rib-tickling lines and funny innuendos. Trisha Bora does a fine job with the narration, sticking to the storyline, at the same time digressing when it is required. For example, she talks about the city of Delhi - where the story is based - quite well; where a non-Delhiite like me could relate and understand. All in all, this book is very in-sync with today's generation and most parts are quite relatable. If you feel like you need an entertaining read, go for this. 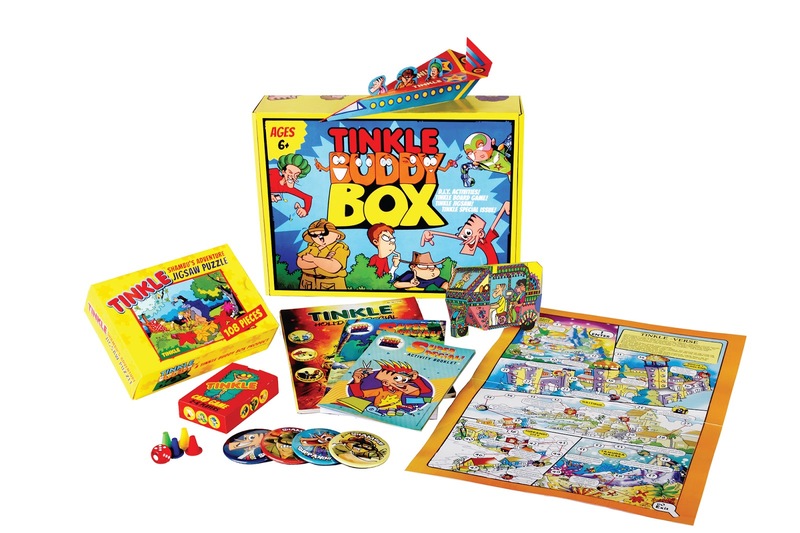 My childhood in the nineties revolved around reading Tinkle, Champak and Chandamama. And from these periodicals stemmed my passion for books, series like Harry Potter and Poirot, and helped me take baby steps towards the world of literature. 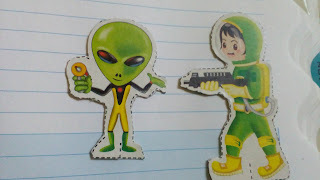 However, what I did not realise then was the magic of the colourful characters like Suppandi, Chacha Chowdhury and Shikhari Shambhu that were amusing and how most had a moral or a lesson to tell in the end. I also looked forward to solving a riddle or puzzles like spot the differences. Over time, we all grew up and we pushed it away for more trivial pursuits including our affiliation for technology. 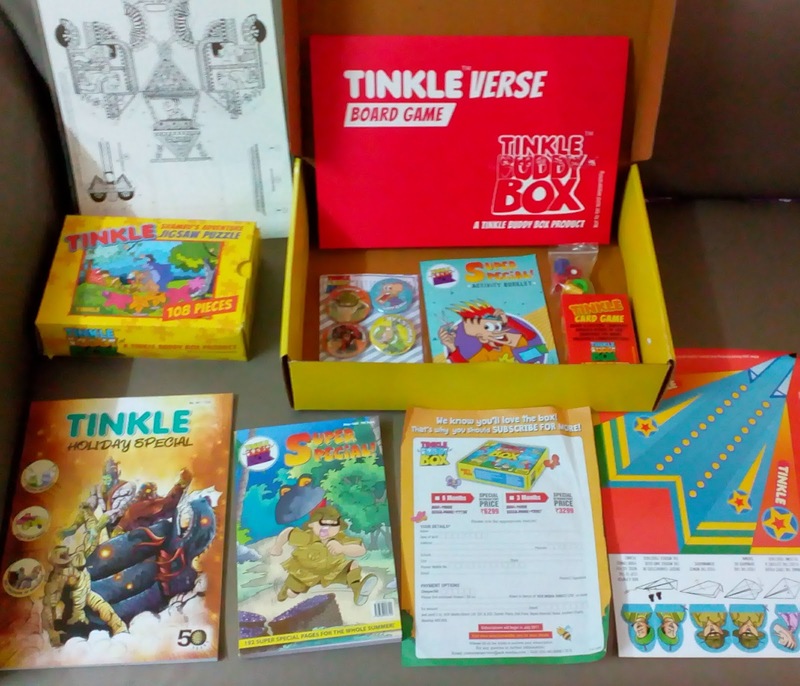 We forgot about the charm and unadulterated joy that a freshly minted copy of Tinkle or Champak got us when we were gifted one or spotted one at our sibling's or friend's place. 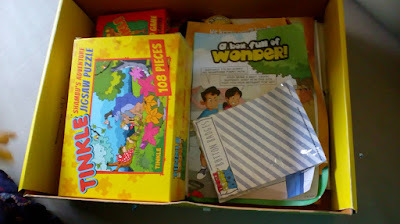 An irreplaceable part of my childhood were these periodical paperbacks. I soo wanted to do an un-boxing video, but my daughter beat me to it. She was super elated with her shiny new box of things that she has seen for the very first time. 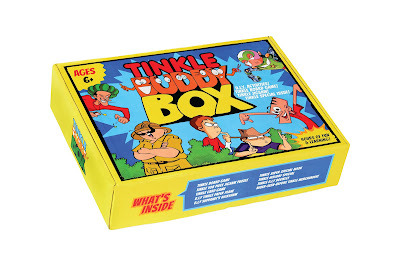 It was perfect timing since she has her vacations and I was just thinking of purchasing an activity box to keep her busy while I was away. All this equates to a whole lot of fun. Even though my darling daughter isn't 6 yet and is still young to understand most games, she thoroughly enjoyed piecing the puzzle and making an aeroplane and Suppandi's autorickshaw - the DIY art projects. 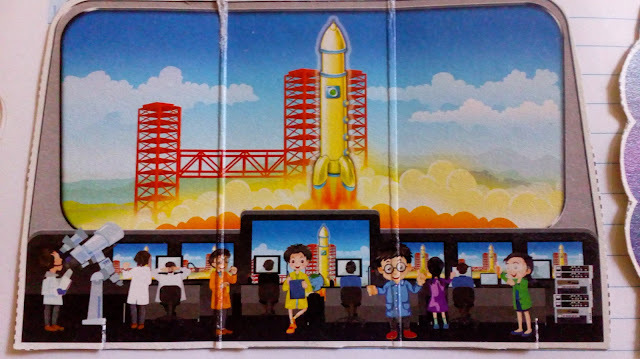 For kids ages 6 and more: It is hours of fun and learning for your child, away from the television or smartphone. They are bound to be glued to the activities that will keep them engaged. 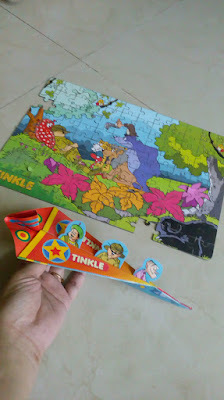 I had my nephew and niece go ga-ga over the fun-filled activities. 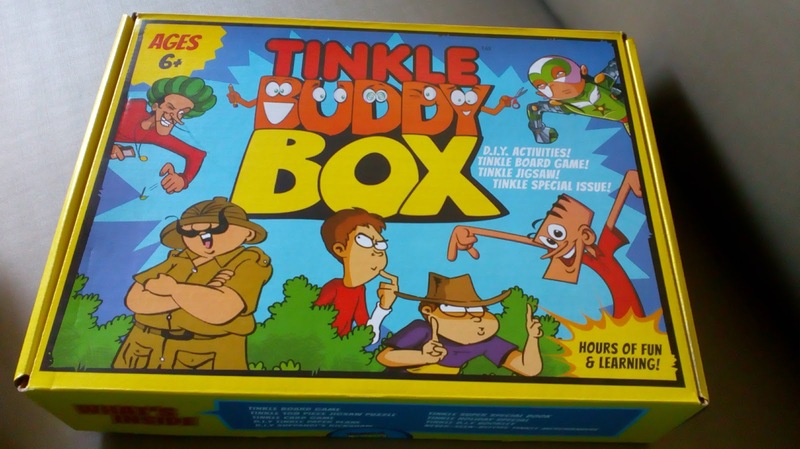 For kids less than 6 years of age: This box will give you an opportunity to spend quality time with your kid. 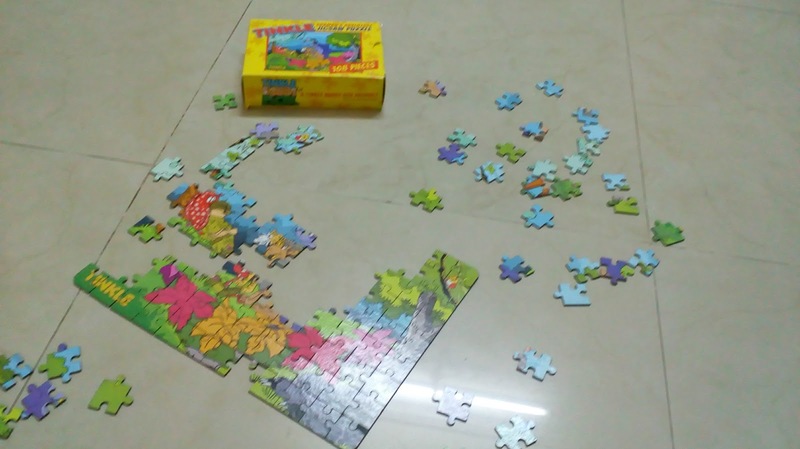 knowing that most of us parents have very little free time on our hands. You can develop a lot of your child's skills through this pack of activities and keep them engaged and away from the smartphone mania. 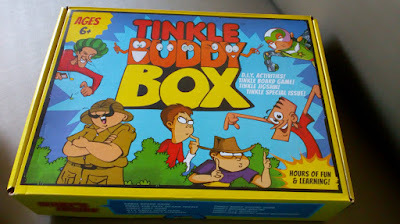 I know I created a mini storm on my Instagram account @missalpao just by posting a snapshot of this box. 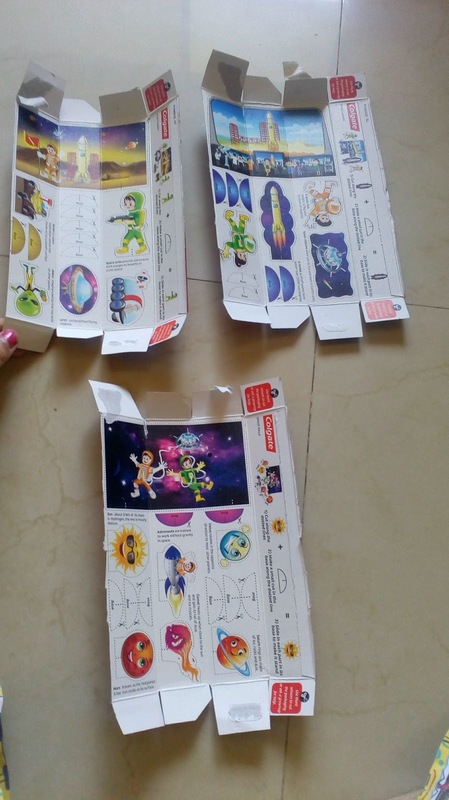 My kiddo and I had loads of fun with this activity box. So head out and grab a box for your kid (or may be for you!). As kids, our lives kinda revolved around stories. Be it before going to bed or for being coaxed to eat up those veggies. Our grandparents, parents as well as our elder siblings showered us with stories of their experiences, sojourns and life's lessons. Enriched with these stories, we took each day as it came...with a burst of creativity and imagination. But then arose a problem. We stopped sharing these stories. Partially to blame is the addiction we have towards gadgets. And partially, because we may have become lazy and uninterested in this ritual. This thought made me wonder, how limited our kids' imagination might become if we don't encourage them to build and share stories. We may have developed a habit for thinking practically but kids are still young and need to be exposed to various creative experiences and develop their own way of thinking, questioning and understanding. Colgate Magical Stories - An breakthrough initiative by Colgate Palmolive has reopened the doors of creativity and imagination in the children's lives. In association with BlogAdda, India's leading network of bloggers, they've tried to bring back the beauty of incredible stories in children. I too signed up for this initiative for my daughter. 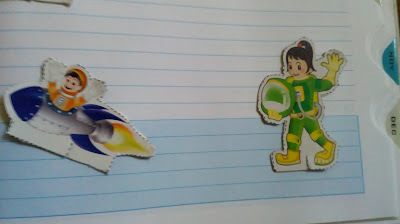 I want my daughter to start young in expanding her creative skills. 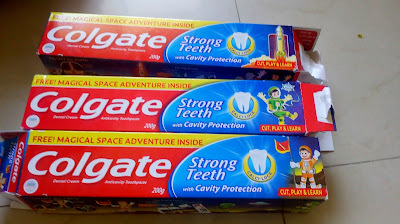 I received three packs of Colgate toothpaste with a different space adventure inside. My daughter was elated in learning about the contents of these packs. 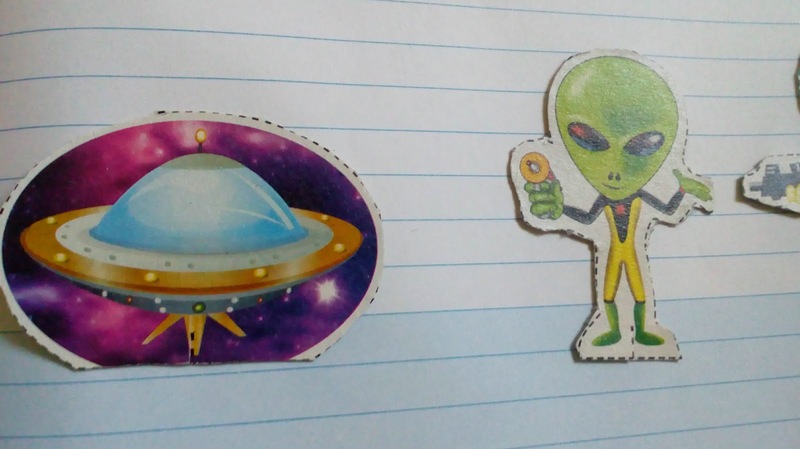 As she has limited knowledge of the planets, space and the solar system, I took this as the right opportunity to show and tell her about them. 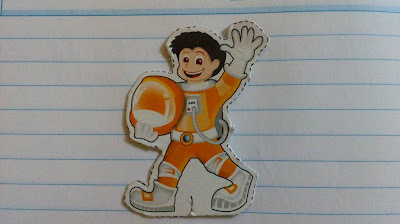 Here is Tony, our space crusader. 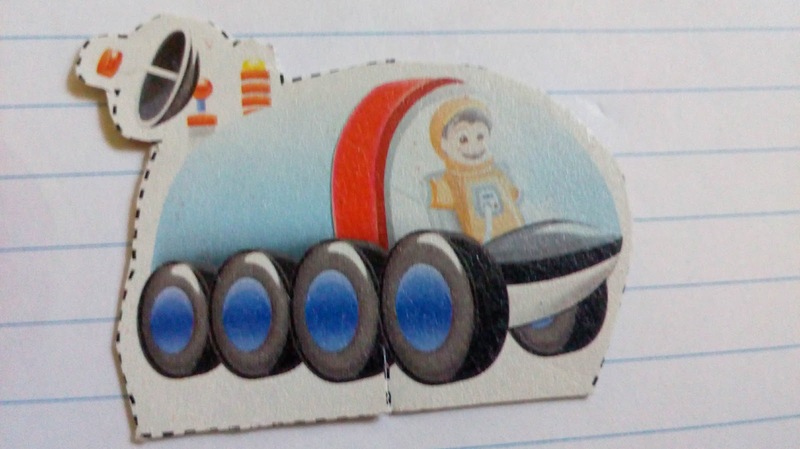 Like every astronaut he sits in a rocket. Ready to launch, 3...2...1...BLAST OFF! 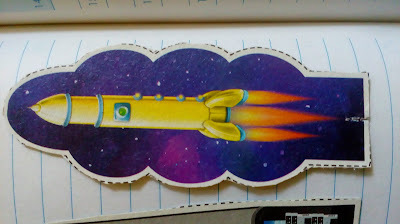 The rocket travels far away from the earth and into space. It passes through the International Space Station. "I'll visit my friend Tina after I complete my mission." says Tony. 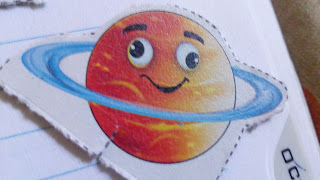 He successfully lands on the surface of Mars. 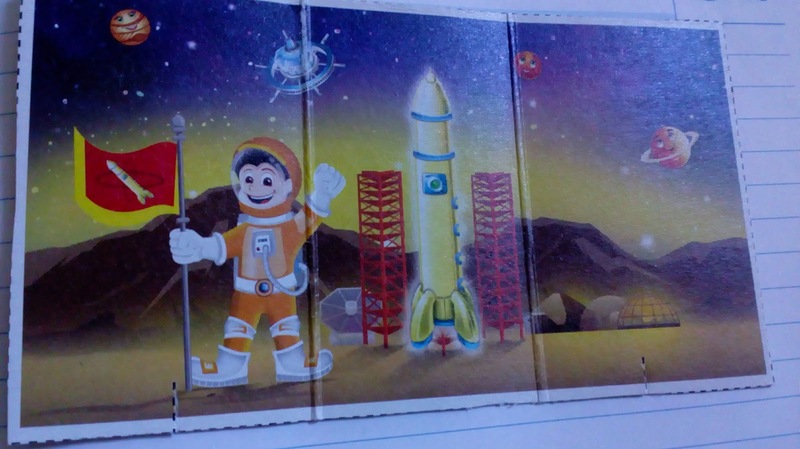 Tony places his flag on the Martian land. Now, it is time to explore this planet. He sets out to explore in his buggy. "What's this. 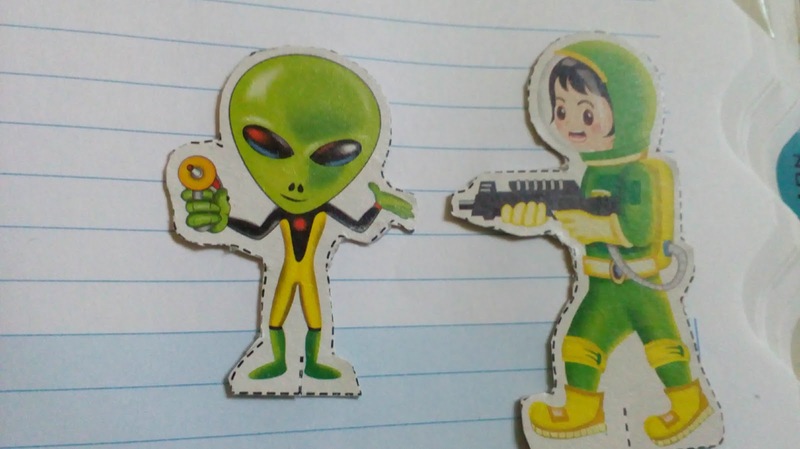 We have company!?" 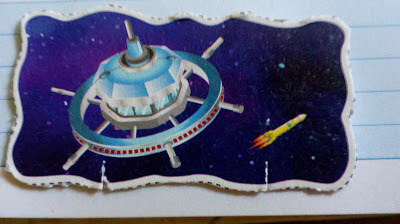 Tony exclaims on eyeing the spacecraft and the Alien being. "Hello" says Tina and Tony is surprised to see her there. 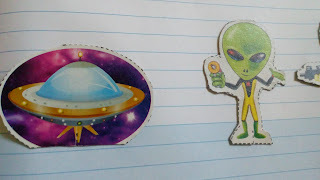 The Alien gets scared and leaves the planet in his spaceship. Tina invites Tony to her Space Station. 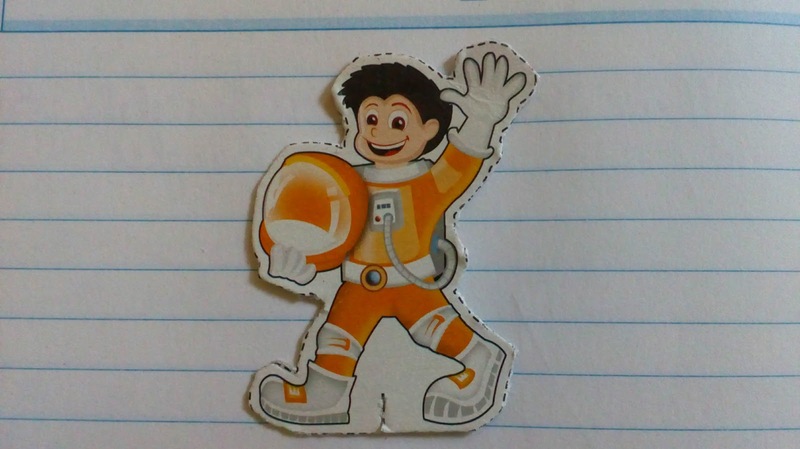 Floating in outer space, Tony gets to see the various planets and inter-celestial bodies. Having successfully completed his voyage, Tony bids adieu to Tina and heads back to earth. 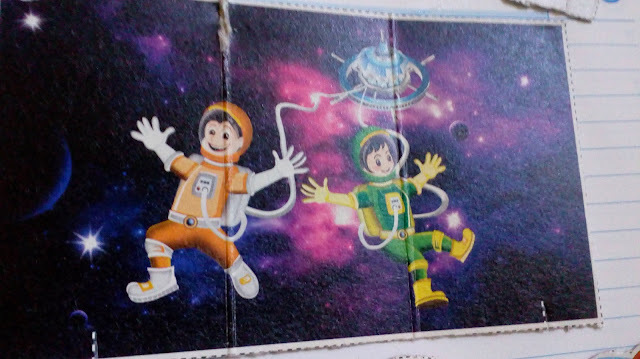 Wasn't it a magical story? What did you think?